The Second Sunday after Pascha is of semi-double rite and its liturgical colour is white. At Vespers yesterday afternoon the psalms for Saturday (Pss. 143, 144, 145, 146 & 147) were sung under the single antiphon, Alleluia. The chapter, Carissimi: Christus passus est pro nobis etc, was proper to the Sunday, the Office hymn was Ad coenam Agni providi and the antiphon on the Magnificat was Ego sum pastor ovium. After the collect of the Sunday the Commemoration of the Cross was sung. At Vespers this consists of the antiphon Crucem sanctam subiit qui infernum confregit, accinctus est potentia, surrexit die teria, Alleluia. the V & R, Dicite in nationibus, Alleluia and Quia Dominus regnavit a ligno, Alleluia and the collect Deus, qui pro nobis Filium tuum crucis patibulum. The Commemoration of the Cross is sung at both Vespers and Lauds when the Office if of semi-double rite or below from the Monday after Dominica in Albis. At Compline (Pss. 4, 30 vv 1-6, 90 & 133) Te lucis was sung to the Paschal tone with the Doxology Gloria tibi Domine etc and the Dominical preces were sung. At Mattins the invitatory and hymn are sung as last Sunday. Again, at the nocturns the psalms are sung under a single antiphon. In the first nocturn (Pss. 1, 2, 3, 6, 7, 8, 9, 10, 11, 12, 13 & 14) the lessons are from the Acts of the Apostles. The first lesson is the same as in modern recensions. The second lesson begins Et exinde but continues Viri fratres...a Pilato , ut interficerent eum. The third lesson begins Cumque consummasssent omnia and continues for several additional verse ending with Quem vero Deus suscitavit a mortuis, non vidit corruptionem. In the second nocturn (Pss. 15, 16 & 17) the lessons are taken from the first sermon on the Ascension of the Lord by St. Leo. These are the same as in the later editions. In the third nocturn (Pss. 18, 19 & 20) the homily is from St. Gregory, again the text is the same as in the post-Clementine editions. At Lauds psalms 92, 99 & 62-66 are sung under the nine-fold Alleluia. Benedicite is sung under the antiphon Surrexit Christus and psalms 148-49-150 are sung under the antiphon Alleluia. The Office hymn is Aurora lucis rutilat. The Commemoration of the Cross is sung after the collect of the Sunday. 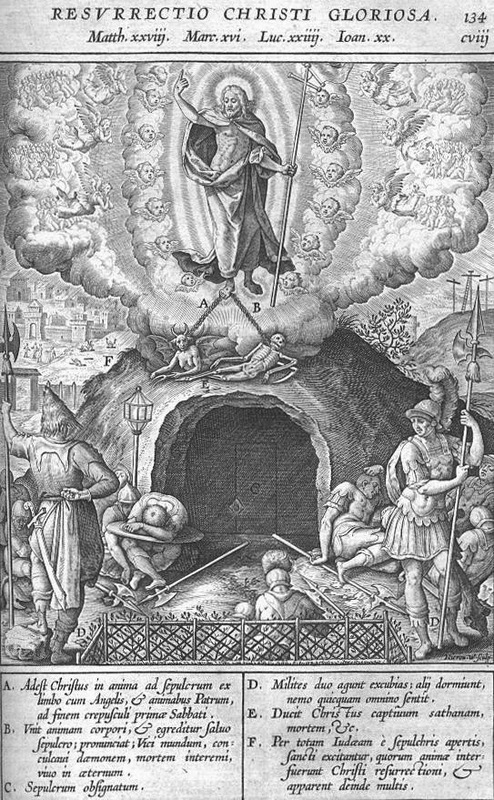 The antiphon for the Commemoration at Lauds is Crucifixus surrexit a mortuis, et redemit nos, alleluia, alleluia. The V & R and collect are the same as those that are sung at Vespers. At the Hours the hymns have the Paschal Doxology. The psalms are sung under an antiphon consisting of a four-fold Alleluia. At Prime (Pss. 53, 118i, 118ii) both Quicumque and the Dominical preces are sung. Mass is sung after Terce. The Gloria is sung, the second collect is Concede nos, the third collect is Ecclesiae. The Creed is sung and the preface is that of Paschaltide. Vespers are of the Sunday, with the psalms (Pss. 109, 110, 111, 112 & 113) sung under a single antiphon. After the collect of the Sunday a commemoration is sung of the following feast of SS Tiburtius, Valerian and Maximus followed by the Commemoration of the Cross. At Compline (Pss. 4, 30 vv 1-6, 90 & 133) the Dominical preces are sung. Dominica in Albis or Low Sunday is of double rite. 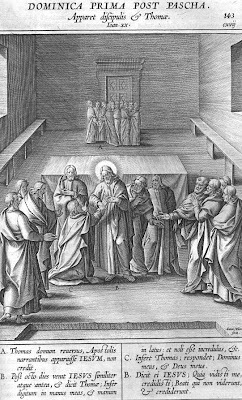 The Gospel at Mattins and Mass is the account of the LORD appearing in to His disciples behind the shut doors of the room and the doubting of St. Thomas. The feast of the Annunciation is transferred from Holy Week to tomorrow. At Vespers the antiphons Missus est Gabriel Angelus ad Mariam etc are proper to the feast and are sung with the psalms from the Common of the BVM (109, 112, 121, 126 & 147). The chapter is proper to the feast, the Office hymn, Ave Maris stella, from the Common. The antiphon on the Magnificat and collect ae proper to the feast. After the collect of the feast a commemoration of the Sunday is sung. At Compline the hymn, Te lucis, is sung with the Doxology in honour of the Incarnation, Gloria tibi Domineetc. After None is completed (or, in Pontifical functions celebrated by the Ordinary after Sext when the New Fire is blessed) the ministers of the Mass go to the sacristy and vest (celebrant in violet stole and cope; the deacon and subdeacon in violet folded chasubles). Meanwhile a fire, struck from flint as the rubric above describes, is kindled and charcoal placed on it for the thurible that will be used. A procession comes from the sacristy to the place where the new fire is to be blessed. The procession is headed by three acolytes. In the centre the first acolyte carries the lustral water container and sprinkler. To his left is the second acolyte bearing the grains of incense on a salver. The thurifer, with an empty thurible, walks to the right of the first acolyte. Following is the subdeacon carrying the Processional Cross, then the choir and lastly the celebrant and deacon. At the new fire all uncover and the subdeacon stands on the other side of the fire, opposite the celebrant. The celebrant then sings three collects of blessing of the fire and one for the grains of incense. The charcoal is put in the thurible and incense blessed as usual. The deacon then changes from a violet folded chasuble to a white dalmatic. The deacon (or the celebrant if there are no ministers) takes a reed with a triple candle upon it with its branches arranged 'triangulo distinctis'. A procession is formed with acolytes bearing the five grains of incense to be inserted into the Paschal Candle and thurible followed by the subdeacon carrying the cross, followed by the choir, then the deacon with the reed and finally the celebrant. The procession pauses three times as it enters the church progressing towards the altar. Each time one of the wicks of the candle being lit from a taper bearing the new fire, the deacon (or celebrant) proclaims Lumen Christi and the choir responds Deo gratias, each time on a higher note. The celebrant reads the twelve prophecies (these derive from the ancient Jerusalem praxis c.f. Talley). In the middle of choir lectors chant each prophecy. After each (except the twelfth) the celebrant sings Oremus, the deacon Flectamus genua and the subdeacon Levate. Tracts follow the fourth, eighth and eleventh prophecy. After the twelfth prophecy, if the church has a font, the celebrant again dons the violet cope and a procession is formed to the Baptistery whilst Sicut cervus is sung. In the Baptistery the font is hallowed by the celebrant singing a preface of blessing culminating in the Paschal Candle being plunged into the waters of the font three times and Chrism being infused into the waters. Here baptisms, if any, are carried out. Anciently this liturgy was when adults were baptised and the prophecies were the last catechumenal address. As the ministers leave the Baptistery two cantors kneeling in choir start the Litany of the Saints. As in all Processional Litanies the invocations are doubled i.e. the invocation and petition is sung by the cantors and repeated by the choir. On their return to the sanctuary the celebrant and ministers remove the cope and chasubles and prostrate before the altar. At Peccatores, te rogamus audi nos they rise and leave the sanctuary to vest for Mass whilst the Litany continues. Meanwhile acolytes remove the violet altar frontal (and violet humeral veil over the credence etc), light the altar candles and prepare the altar for Mass. The celebrant, deacon and subdeacon return to choir, now vested in white, as the choir sings the Kyrie. The celebrant says Judica me etc and the altar is then censed as at the beginning of any High Mass. At the Gloria in excelsis the bells are rung as on Mandy Thursday. Before the Gradual the celebrant sings Alleluia solemnly three times. At the Gospel the acolytes carry do not carry candles. There is no Creed or Offertory chant. The Little Hours are chanted exactly as yesterday morning, the only difference being that Mortem autem crucis is added to Christus factus est and that the altar candles are not lit. At the usual time Compline is recited on a monotone, as the Little Hours were this morning. The altar candles are not lit. Again its form is absolute simplicity beginning with the Confiteorand the usual psalms (4, 30 vv. 1-6, 90 & 133, Nunc dimittis and then Christus factus est, Miserere and Respice as at the other Hours. At Compline this evening only Christus factus est pro nobis obediens usque ad mortem is said as it is still part of the Office of Mandy Thursday. The choir altar is as it was after the stripping this morning with six candlesticks containing candles of unbleached wax with the altar Cross veiled now in black. At Mattins the first antiphon is Astiterunt reges. 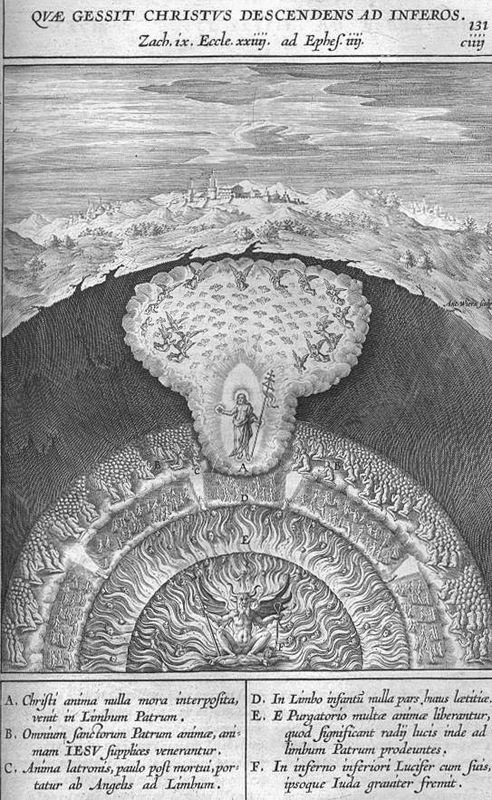 The psalms are strictly proper: in the first nocturn Pss. 2, 21 & 26. The lessons are again from the Lamentation of Jeremy the Prophet. The lessons are longer than those found in the later editions. The first lesson has the addition of Lamech (Lamed). The second lesson has the addition of Phe, Ain and Sade (vv. 16-18). The third lesson has the addition of three verses of Daleth, vv 10-12 of the third chapter. In the second nocturn Pss. 37, 39 & 53 are sung. The lessons are, as yesterday evening from St. Augustine. These are significantly longer than those found in the later editions with the fourth lesson comprising of the text found in both the fourth and fifth lesson in the later editions. The text found in the sixth lesson is entirely absent from the later books. In the third nocturn Pss. 58, 87 & 93 are sung. The lessons, from St. Paul to the Hebrews, are slightly longer than those found in the post-Clementine books. After Tenebrae in Cathedral and larger churches the Ceremonial Washing of the Altars takes place. The bare mensae are washed with a mixture of water and wine and the surface scoured with brushes and dried with towels whilst Diviserunt and psalm 21 is monotoned. After this service Christus factus est ... Mortem autem crucis is added. A setting of the Miserere by Victoria. After the Gospel the celebrant removes the violet cope and puts on an apron. 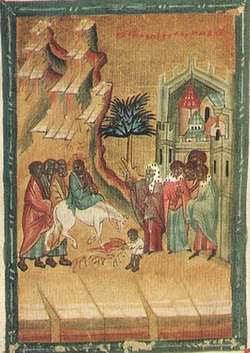 The ministers remove their maniples. Meanwhile thirteen Canons or paupers seated on benches remove their shoes and socks. Acolytes take a basin, ewer, towels and a plate bearing coins to the first of them. The celebrant kneels before the Canon, or pauper, and water is poured over their right foot, held by the subdeacon. The deacon passes a towel to the celebrant (with the usual oscula) and the celebrant dries the foot and kisses it. 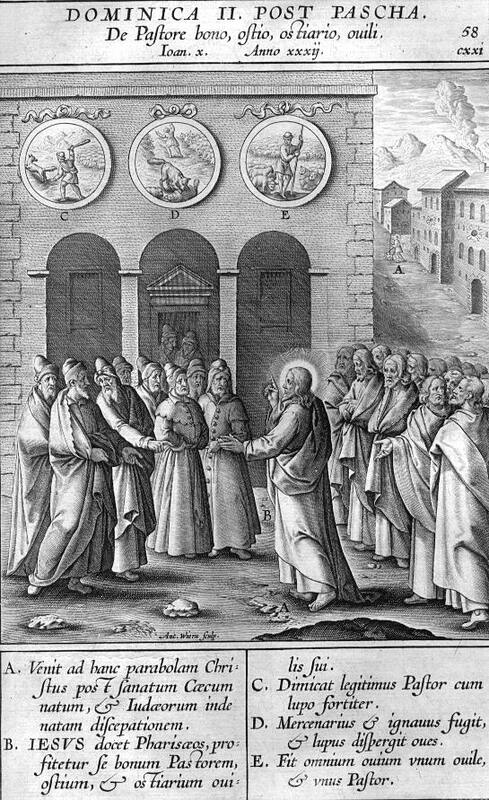 He then gives the pauper a coin who takes it and kisses the celebrant's hand. This process is repeated for all thirteen. During this the choir sings the antiphon Mandatum novum (the text giving Mandy Thursday its English name). Eight other antiphons are provided including the famous Ubi caritas. After the last pauper's foot has been washed the celebrant and ministers return to the credence where the celebrant washes his hands and resumes the violet cope. They go to the Epistle corner and there the celebrant intones Pater noster (continued in silence), some versicles and the collect Adesto. All then return to the sacristy. Anciently, Mandy Thursday was the day when the public penitents, previously expelled from the church on Ash Wednesday, were reconciled. When there were multiple Masses this day the first was for the reconciliation of the penitents. The rite for reconciliation, in some ways a mirror image of the rite of expulsion in that the penitents were led back into church, can still be found in the Pontificale Romanum. In the morning the Hours of Prime, Terce, Sext and None are chanted in aggregation. The choir altar remains vested as it was yesterday evening for Tenebrae with a violet antependium, lighted candles of unbleached wax and a violet veil on the Cross. The Little Hours take on a special and much simplified form during the Triduum in the Roman rite. The choir enters the sanctuary, seniores ante inferiores, and kneels for Aperi, Domini then rises whilst a Pater noster, Ave Maria and Credo are said on the lips. The usual start of the Hours is omitted, as are antiphons, and Prime begins with the first verse of Psalm 53, Deus, in nomine tuo salvum me fac being intoned by the duty side cantor. The choir Signs itself at the opening words. The psalms are monotoned the verses taken by alternate sides of choir. Gloria Patri is not sung or said during the Triduum. After the last verse of Ps. 53 the choir continues, without break or intonation, with the first stanza of Ps. 118, Beati immaculati, and then with the second stanza Retribue. At the last verse a fall of a tone is made on the last syllable. The choir kneels and Christus factus est recited as far as ad mortem. A Pater noster is then said by all and the Miserere monotoned in a subdued voice. Other than polyphonic settings that may be sung at Tenebrae the Miserere is never sung at the other Hours of the Triduum but always chanted as above. During the last verse of the Miserere again a fall of a tone is made on the last syllable. The Hebdomadarius then montones the collect Respice, falling a tone at the last syllable of tormentum and then the conclusion is said in silence. The choir rises and says a Pater noster and Ave Maria on their lips. Terce then proceeds as Prime had done the choir Signing at Legem pone mihi. A fall of a tone is made at the end of the third stanza of Ps. 118 and everything repeated as at Prime: Christus factus est, Pater noster, Miserere and collect Respice. Sext and None follow in the same manner. After None the choir rises and the Hebdomadarius and ministers for Mass go to the sacristy to vest. Meanwhile the choir altar is prepared for Mass. The unbleached candles are changed for ones of lighted bleached wax, a white antependium is laid over the violet one and a white veil placed over the altar Cross. Mass is celebrated in white vestments. Today two Hosts are consecrated and thus placed on the paten before Mass. The organ may be played until the end of the Gloria in excelsis. The psalm Judica me is not said as the Mass is de Tempore. Gloria Patri is not sung at the introit, Nos autem, or at any of the other chants. As the Gloria in excelsis is sung may be rung. There is one collect. The Credo is sung. The preface is of the Cross, the Communicantes, Hanc igitur and Qui pridie are all proper in the Canon. The Agnus Dei is sung as usual but the Pax is not given. When the celebrant has communicated he takes the second Host and places it in a second chalice. The deacon then covers this chalice with a pall then an upside down paten over which is placed a white silk veil which is then secured with a ribbon tied around the stem of the chalice. (If the celebrant is without a deacon the chalice is veiled but the ribbon not tied at this point as tying a ribbon with ones thumb and digit held together is not practical. In this case the tying takes place after the ablutions). Mass now proceeds following the rules coram Sanctissimo - basically no one turns their back to the Sacrament. Holy Communion is distibuted as normal following the Confiteor etc. After Vespers the ministers of Mass return with the priest and deacon vested in violet stoles. The celebrant of the Mass monotones the antiphon Diviserunt sibi which the choir continues followed by Psalm 21. The choir altar (and then other altars if present) are then stripped of cloths, antependia etc leaving only the veiled Cross and candlesticks. The candles and sanctuary lamp are extinguished. Lustral water is removed from the entrances to the church. The brethren retire for their collation. A most wonderful composition perfectly capturing the mood of Tenebrae. His Miserere for Tenebrae is quite stunning too (see below), perhaps a shade or two less wonderful than the setting of the Benedictus but nevertheless a suitable piece to listen to and reflect on in the darkness at the end of the service. During the late afternoon or early evening of Spy Wednesday Compline is sung followed by Tenebrae . At Compline the psalms still have the Lesser Doxology at their conclusion. The Dominical preces are sung and after the conclusion of the Office Ave regina caelorum is said for the last time this year. Tenebrae is Mattins and Lauds, as usual anticipated, of the following liturgical day but the Office of the Triduum shows signs of antiquity and has developed a ceremonial extinguishing of candles that mimetically represent the desertion of the LORD by his disciples and the days of darkness - hence the name. The choir altar retains its violet antependia but the Blessed Sacrament is removed if It is present on the choir altar. The altar cross is veiled in violet and the candlesticks, the plainest set used on Good Friday, have six lighted candles of unbleached wax. In the sanctuary in about the place where the Epistle is sung is placed the Tenebrae hearse. The hearse, for the Roman rite, bears fifteen lighted candles of unbleached wax. The choir enters, seniores ante inferiores, and take their places and kneel to say Aperi, Domine and the Triple Prayer sub silentio. When the choir rises the sign of the Cross is made as the cantors intone the first antiphon of Mattins, Zelus domus tuae. This is sung in full and then the first psalm Salvum me fac, Deus intoned by the cantors. In the last verse of the psalm, after the asterisk, the tone changes and the psalm ends, regardless of the reciting tone, with a drop of a fourth. The psalms of the first nocturn are Pss. 68, 69 & 70. At the end of the psalm (the Lesser Doxology is omitted for the Triduum) the lowest candle on the Gospel side of the hearse is extinguished. Then the next antiphon is sung with its psalm etc. After the first three psalms there is a versicle and response and then all stand for a silent Pater noster. During the Triduum there are no absolutions and blessings at Mattins. The lessons of the first nocturn are from the Lament of Jeremy the Prophet. These are longer than those found in the post-Clementine books. The first lesson begins with Aleph but continues with the addition of Vau after He. The second lesson begins with Zain and continues with both Jod and Caph after Teth. The third lesson begins with Lamech and, after Nun has the addition of Samech and Ain. A responsory follows each lesson. In the second nocturn, Pss. 71, 72 & 73, the lessons are from a treatise of St. Augustine on the psalms. These are the same as those found in the modern books. In the third nocturn, Pss. 74, 75 & 76, the lessons are from St. Paul to the Corinthians on the foundation of the Holy Eucharist. These are the same as in the post-Clement books. At Tenebrae the Hebdomadarius does not chant the ninth lesson. At the end of Mattins the Tenebrae Hearse has five candles exstinguished on the Gospel side and four on the Epistle side with six remaining candles still burning. Lauds follow immediately. The psalms sung at Lauds are Pss. 50, 89, 62-66, Cantemus Domino and 148-149-150. After each psalm of Lauds a further candle is extinguished so that after the last psalm only the candle on the summit of the hearse is still alight. After the last antiphon is repeated a versicle and response follow. Then the antiphon on the Benedictus is intoned, for Mandy Thursday this is Traditor autem dedit eis signum, dicens: Quem osculatus fuero, ispe est, tenete eum. The concept of the betrayal of Judas is key to the day. The plainsong for the Benedictus is the haunting tone 1g. During the last six verses of the canticle each of the altar candles is exstinguished beginning with the outside candle on the Gospel side. All other lamps in the church are now also extinguished. During the repetition of the antiphon the MC takes the candle from the hearse and places it on the mensa at the Epistle corner of the altar. All kneel and the choir now sings Christus factus est pro nobis obediens usque ad mortem. During this antiphon the MC hides the lit candle behind the altar. A Pater noster is now said in a low voice by all and then psalm 50, the Miserere is chanted in a subdued voice. This has been adapted by many composers into polyphonic masterpieces, perhaps the most famous being by Allegri. The Miserere is of course part of the ferial preces of Vespers. After the Miserere the collect Respice is chanted by the Hebdomadarius, still kneeling. Then a strepitus, is made. After the strepitus the MC brings forth the candle and returns this symbol of the light of Christ to the top of the hearse. It either remains there, or is extinguished or, what seems the better practice, is taken by the MC ahead the procession as the choir retires.